Bluestar has nearly 100 staff specialized in mold design. We set up R&D center providing from product development, project management, technology support, various mould design and manufacturing, quality inspection and after sale service to global top companies. Along with the all aspects of secondary development, IM3 System, ERP System and mould standardize, all aspects have been enhanced such as quality control system. Design team use CAD, CAE and CAM to assist design. CAD output 2D drawing and 3D image. CAE simulation is to ensure optimal manufacturing mode and then using CAM for computer imitation. Relying on advanced equipment and 20 years experience, Bluestar has built a diversified customer base. Bluestar follow prevention-oriented philosophy before starting a new project .Special Review Team consists of Engineering department, Manufacturing department, Project Department, Quality Control Department and Purchasing Department adopts mold flow analysis, experience summary of similar projects and precaution potential problems of customers requirements, thereby to ensure the product quality effectively. Bluestar has extended quality insurance to suppliers. Quality is guaranteed from the new supplier assessment, quality assurance capability, production capacity, supplier training and guidance all stage to ensure the high quality of components and raw materials in the first place. The implementations of "Zero Defect" manufacture management. Carrying out quality obligation to each working procedure and total quality management. From the worker, monitor, team leader to supervisor, everyone has specific responsibility and quality target. In accordance with "Three No, Three Do" principles: No rejects are received, manufactured and flowed into market, in accordance with drawing, with process, by standard. Quality control principle is that one should be responsible for what he manufactured, by which everyone keeps quality consciousness in mind. Bluestar has thorough finished product QAS, which means after assembly self-inspection, the inspector will check all the products from clients' view and approve after 100% OK. Every project must go through testing to further ensure quality. Technology and process standard applied in mould manufacturing is regulated for specific category and full covered data information with ERP system process technology standardization system to release standardization of manufacturing process, technology and technological parameter. Technical standard system covers raw materials and injection molding process, mold metal materials and processing technology, mold design, CNC programming, EDM electrode drawing and programming, WEDM programming, deep drilling program, mold assembly, trial, packaging and other manufacturing processes management. 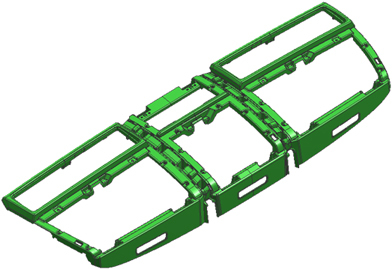 With full Process control, components are machined according to data to make zero-fitting mould. Technical standard system provides full process technology guide during manufacturing, so as to reduce repeat technology study and monitor the manufacturing process for shorter lead time, lower cost and higher quality to meet customer individual needs. Evaluate the material suppliers and communicate with the qualified suppliers and train them to meet our quality requirements. Finalize and discuss detail of the craft.